This is for those of you who like the idea of catching a buzz in your morning tea. When I was pregnant with Penelope I gave up much of my herbal teas, since many of them contained ingredients that could be harmful for pregnant women. I tried to find ones I liked that were deemed “safe” but pretty much got a headache reading about it all, so I made things simple: I drank hot water, with lemon and honey. I wound up liking this basic combo so much that I stuck with it and, in the midst of cold season, added a few more ingredients which resulted in a yummy, spicy, immunity-boosting concoction that I now drink on a daily basis. If you like a bit of ‘zing’ or ‘bite’ to your tea, you’ll especially love this recipe. CAYENNE PEPPER is said to contain healing properties and has been used for many years to boost immunity, fight off colds, and detoxify the body. LEMON and GINGER have been known to work together to promote digestion and circulation, also helping detox the body. You’ll also get a nice boost of Vitamin C with your lemon. 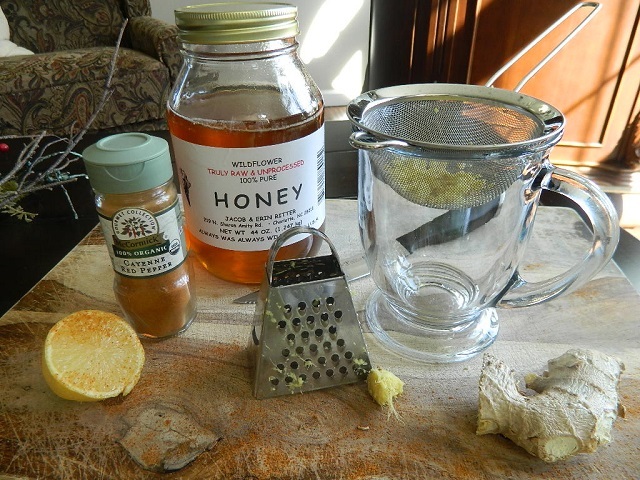 HONEY is said to help soothe a scratchy throat and relieve cough symptoms. Step 2: Boil your water, and pour it right over the ginger. Allow this to steep for 3 minutes. Step 3: Cut a lemon in half, and squeeze a half into your cup. Let the strainer catch any seeds. 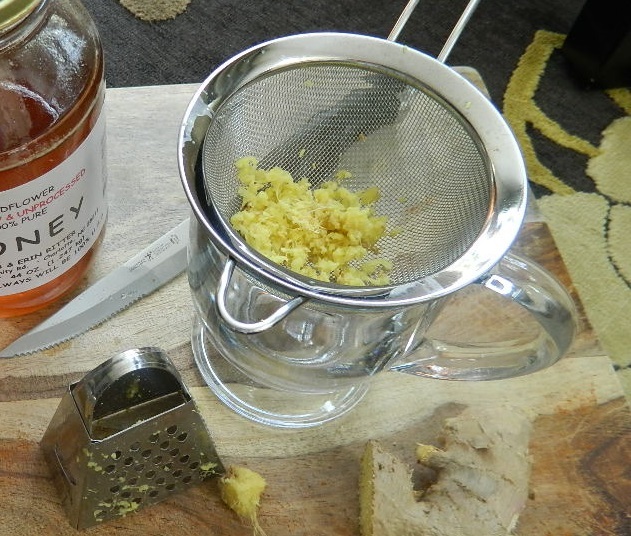 Step 4: Remove the strainer, and stir in the honey. Step 5: Sprinkle a dusting of cayenne pepper – just about enough to create a thin layer at the surface of your tea. Stir it all up, and enjoy your immunity-boosting tea with a kick! I’ve had this combo minus the Cayanne pepper….and it’s awesome. I never thought to get a little strainer like that though. Gotta get one! Thanks for that tip, I didn’t know that about the cayenne!! We do this drink too though I haven’t seen your method! We just throw everything into the mug and pour in the hot water. Hmm… Maybe we should make these adjustments! I wonder if you could substitute turmeric for the cayenne pepper as well? Love your post. 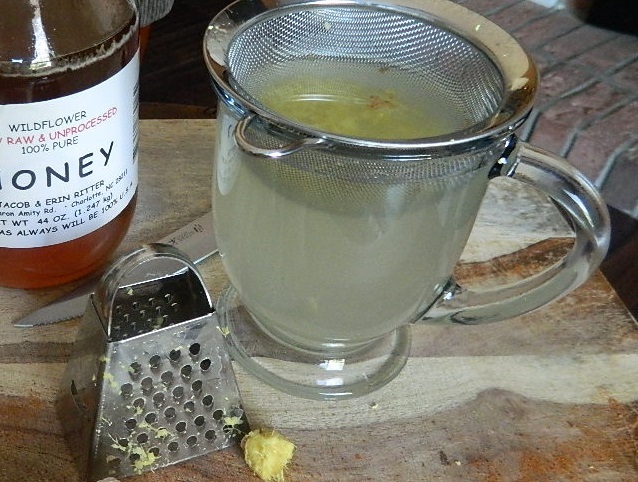 I make ‘Hot Honey with ginger, lemon zest and juice, cayenne or piquin pepper (depending on what I have on hand) and local raw honey. I make a new batch each time I open a jar. Anyway, it is immune boosting. My mom takes a spoonful a day and never goes to a doctor or needs to. And it tastes so good. What a combo, huh? Thanks for sharing! Thank you! I agree – it tastes AMAZING. I like a little ‘kick’ in my tea!